After working on photos, I am now heading for slumber as well. Although we don’t have a flying-carpet postcard tonight, a unique flying carpet is materializing in the bodega! Here are some photos that show the progress! Tortuga Finished! – All of the suggestions (for a name for the painting) were added to the border, though we’ve still not selected a name! A section of the floor was first treated with Agua Stop, a product that blocks moisture on concrete walls and floors. 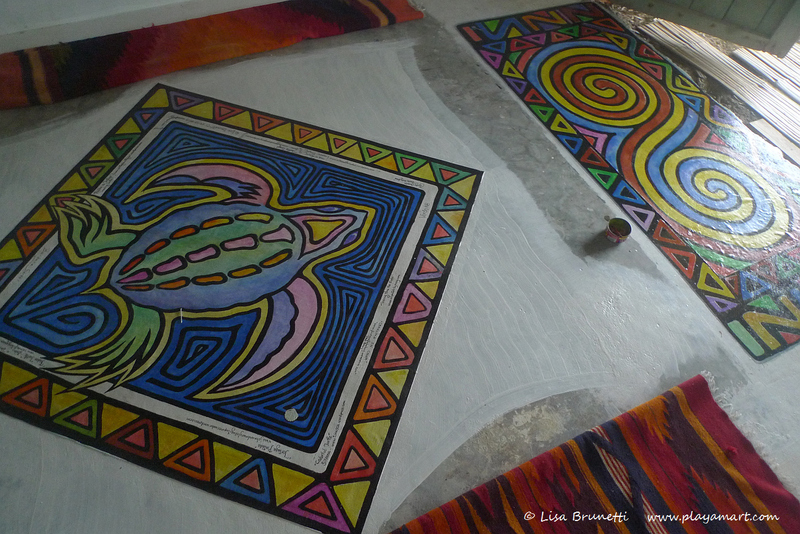 The spiral and turtle were painted on heavy vinyl then glued in place; the border around the spiral was painted directly on the floor. A non-yellowing floor varnish was applied to protect the design. 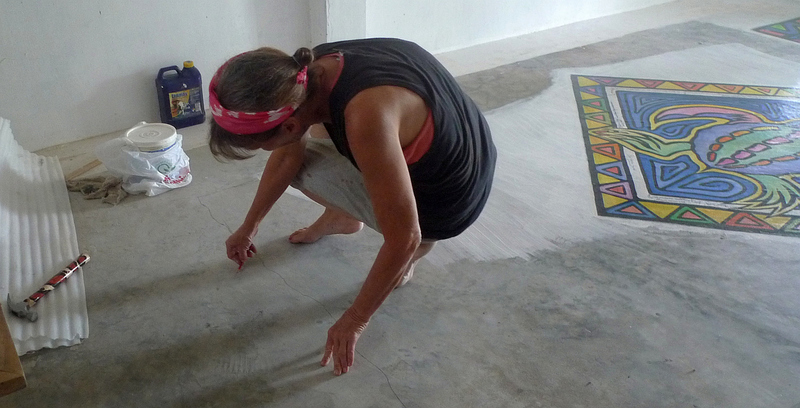 Barb applies non-yellowing varnish for floors. 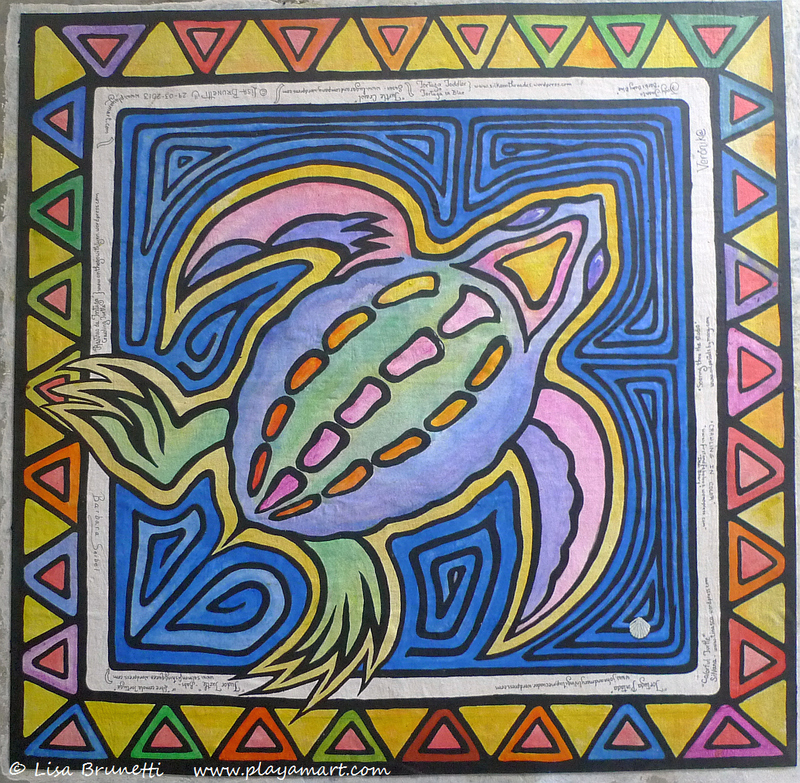 Mary (oilpastelsbymary.com) stated: “The gallery floor will become a great welcome to all those who ride with the turtle as he soars through the studio.“ We looked at the turtle and agreed, “Yes! 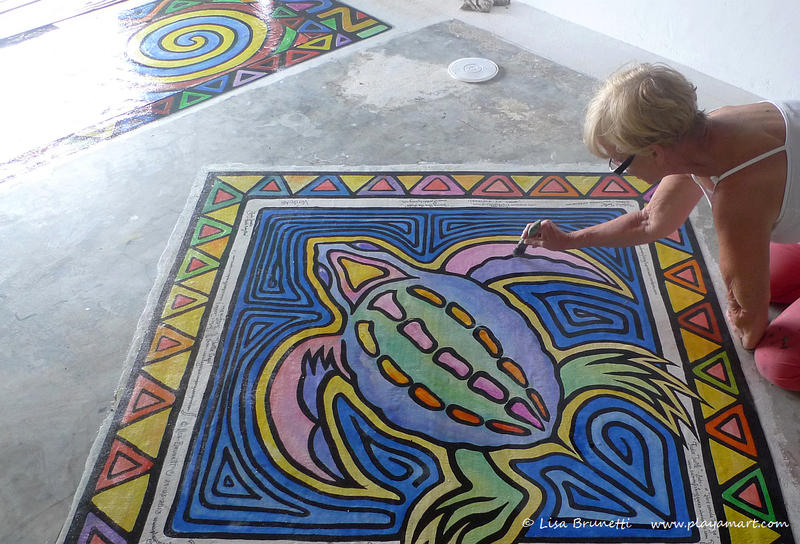 Let’s paint a magic carpet beneath the turtle!” While waiting for the varnish to dry, we drew the border for the flying carpet, painted the area with Agua Stop, then went outside and inspected our loot from Playamart! Outlining edges of flying carpet. (Flying Carpet?!!!) Yes! The next section of the floor was prepped with Agua Stop. 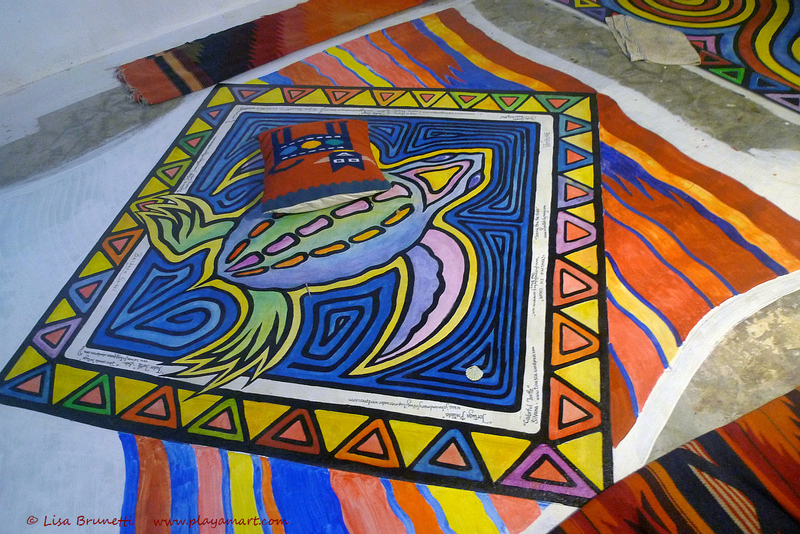 Overlap lines will emphasize the ripple effect of the flying carpet. And to think that some people BURN treasures like these!!!! 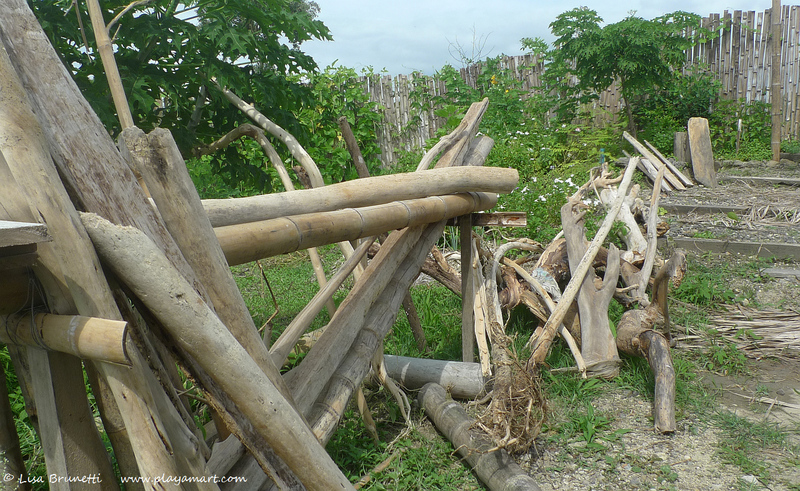 Ideas are still incubating, and we want to finish the floor before we create a masterpiece from driftwood! Barbara’s getting tricky with the camera! 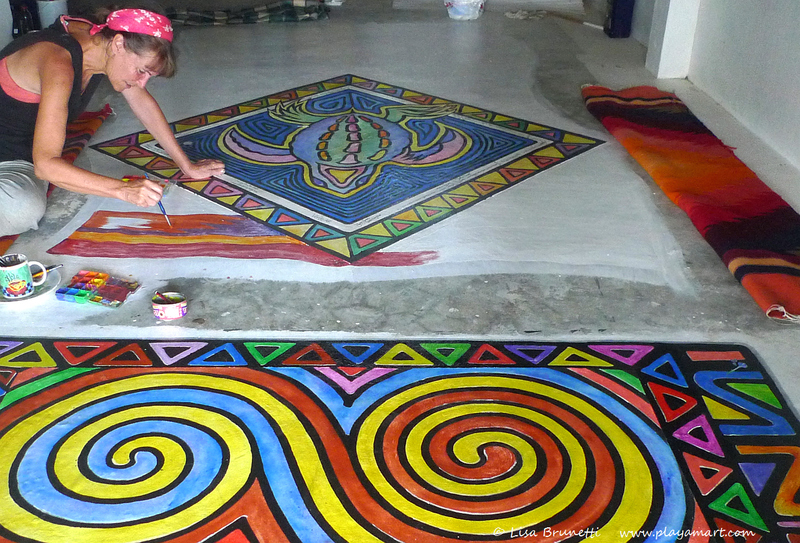 After a late lunch break, we returned to the bodega and began painting the newest section of the floor. 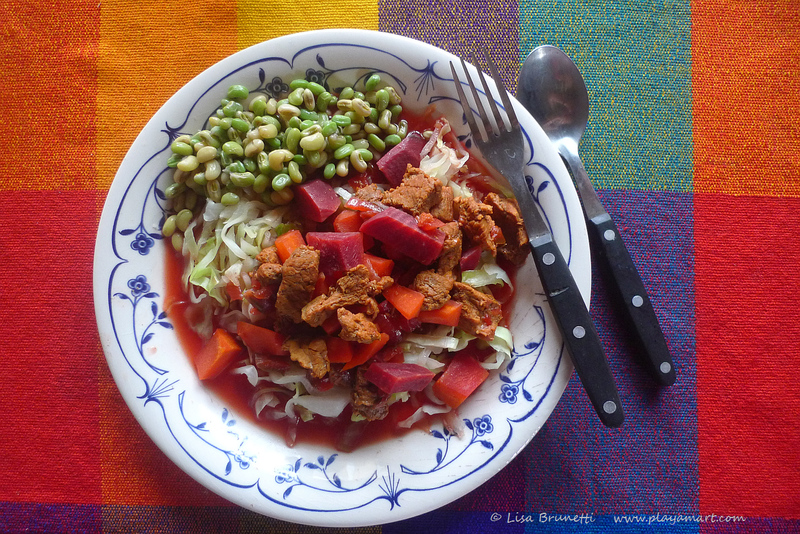 Crock Pot Cuisine: “Free range” beef, beets & carrots over steamed cabbage. Just-picked field peas completed our lunch! Eyeing Ecuadorian rugs for reference, Lisa blocks in bands of color. Barb continues the flow of colors on the opposite side. Color is slowly built/strengthened in washes, more like watercolor than acrylic. 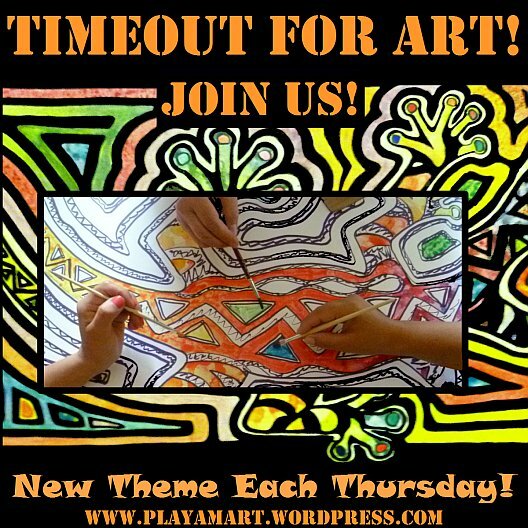 8 p.m. – time to stop for the night! Thanks so much for your support and feedback! 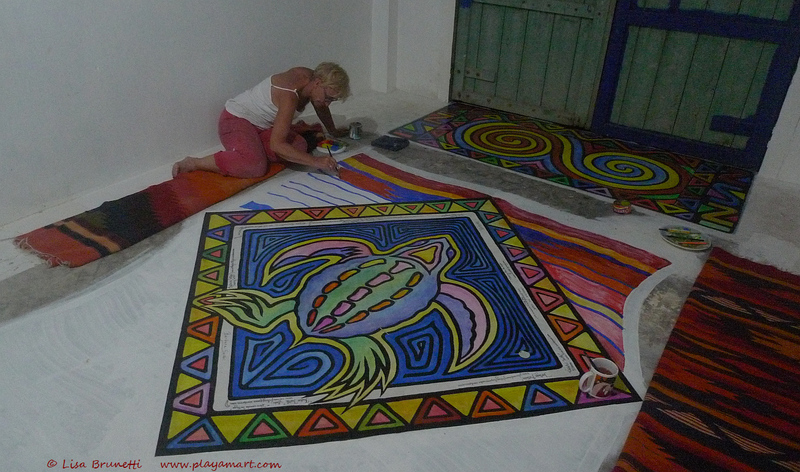 Many people say that the mola series of paintings make the room feel as if it’s moving. This magic carpet is already tricking Barb and me! It’s all but painting itself! We’ll try to update at the end of the next painting session! Enjoying the updates. And how long did you say Barb is staying? I think she may need to extend her visit. 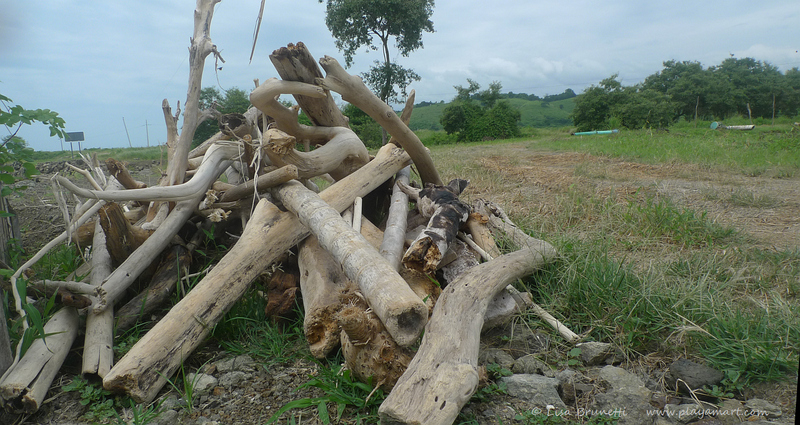 There’s all that driftwood to attend to. she’s here until the 14th, and she would like to see this floor finished before she leaves! we’re working hard, but i think it’s about time to take a day off! fantastic ! Absolutely love them ! I’ll pop an email out, have some questions on the products you’re using. Barb’s visit seems to be quickly flying by. So nice of you to put the name suggestions on the painting itself. thank you! it seemed insensitive not to include those who have taken an active part in the cheerleading dpt! i’ll photograph (in better light) each signature and share them in a post. i’ll be very happy to share what i’ve recently loearned regarding materials. there have been a few great ‘finds.’ and so far they trump the traditional ones! thank you, amiga! sometimes an artist teaches others to see, and i think you’ve just learned one of the ‘tricks’ for how that is done! ‘flat’ and perfect isn’t always the best option! thank you! you just gave barb a nice chuckle! we’re about to get started on the carpet for the day! i guess our day is still awakening while yours is getting quiet! thanks! an update post will be coming soon. i suspect that you’ll enjoy seeing the progress! Wow Lisa what a great surprise!! You know how to bring tears to my eyes – couldn’t believe what I was reading and seeing. I love it, the concepts fits so perfectly together. It’s really neat being able to see how you are building the carpet, it will be one that speaks of great energy and movement. You and Barb have to be exhausted, especially your knees. So Barb how tired are you, ready for a vacation yet?! Can’t wait to see the finished floor. hey! thanks, i’m glad you enjoyed the post. for me, painting is a vacation, and barb seems determined to see this finished before she leaves. after rain in the night, the day is really pretty, and i think i’ll nudge her into an hour’s break this afternoon! hey! barb now laughs every time she looks at the floor, and she recalls your suggestion! thanks so much!!! yes yes yes, please come out!!!! we’re going to teach you how to PAINT! a chicken is in the crock pot, so we have that.. your company is what would be best! i am so glad that i checked the computer!!! thank you! yes, it’s going very well, and we just took a short break.. thanks so much for your support! Oh what FUN! This is so exciting and beautiful and colorful and WOW! thank you so much for your always- positiver feedback! 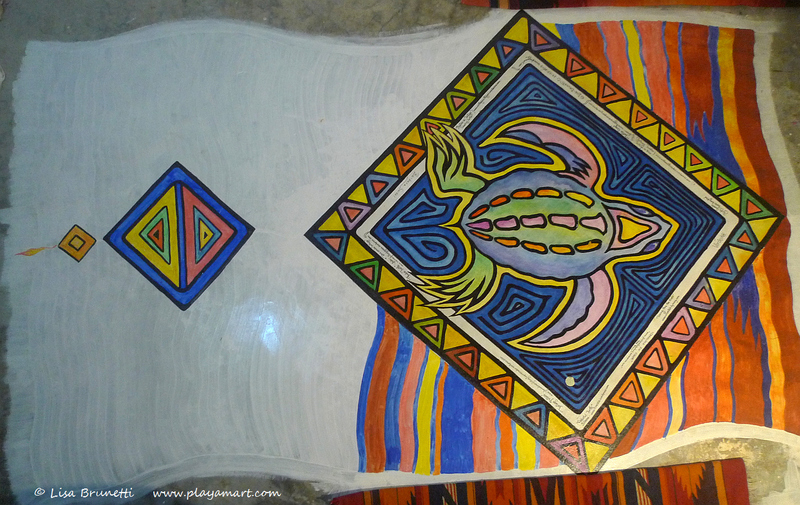 Leave shoes at the door to walk across this tortuga. Love what you are doing. yes, that would be very respectful!| thanks! we’ve been working hard and just took a break! we were w/o power last night and this morning, so i missed the WP computer time! 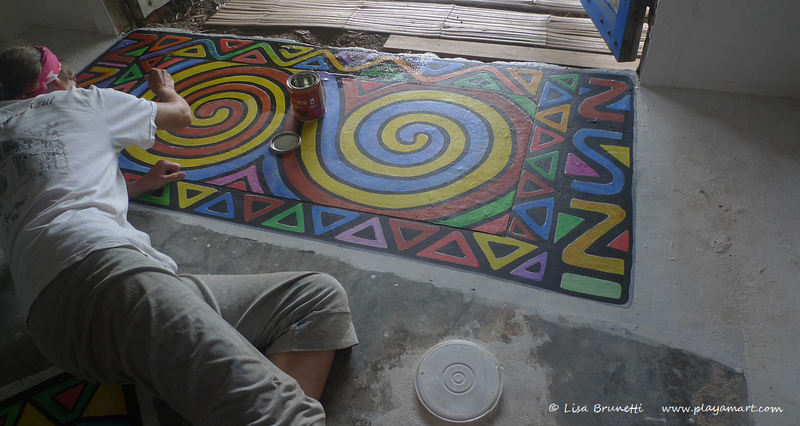 I am exhausted watching you “girls” stretch into every possible position to paint…paint…but look at the results. …and the food is as colorful as the painting! yum yum! after a three-or-four-hour painting session, we’re about to have a maracuy/banana drink… then back to painting. I don’t think I could walk on your carpet! 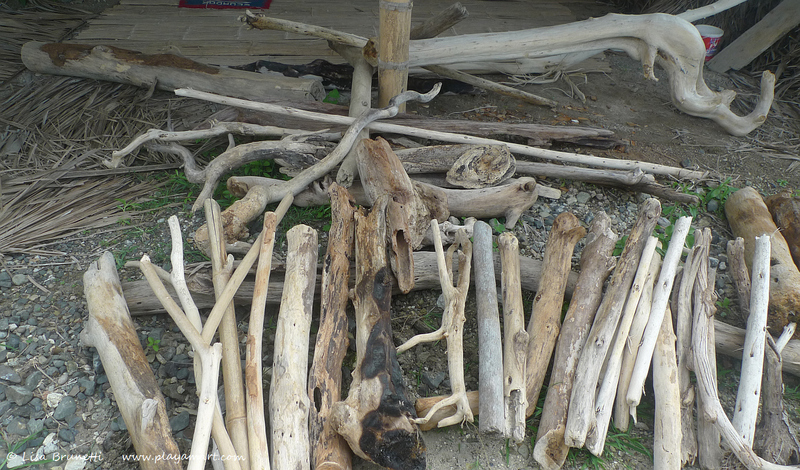 we’re trying to finish the floor, but the driftwood becons! This is so far outside my experience I haven’t much to offer except appreciation! But every great artist needs someone to sit around and murmur encouraging words – your carpet is beautiful. And yes – it does appear to be fluid, just as a real carpet would be. The trompe-l’œil effect is as remarkable as the sidewalk art I so enjoy. You’ll probably have to wait for a really good connection to see this collection , but it’s marvelous! hey! it’s late, and the internet is working faster. we’ve been having power problems this week, so i’m glad to have any connection! the sidewalk art is great, and it is so very amazing. barb and i worked all day on the floor and bodega. she switched to painting thse huge doors, and wow, did they ever transform. the photos are still in the camera, and i’m too tired to work on them tonight. maybe in the morning i’ll get an update posted. i think you’ll really like the progress! Truly amazing! It’s too beautiful to be stepped on… the crock pot cuisine looks yummy! we’ve put in a full day of painting and are about to collapse! i look forward to sharing the next batch of images! Love love love love. Just love. Wish you could paint my floor! thank you so much! i really enjoy taking an old forlorn floor and making it happy! this one is progressing nicely! the floor truly is amazing! thank you, lesli! it has lots of memories locked into its essence! thank you joann! i live on the pacific coast of ecuador! 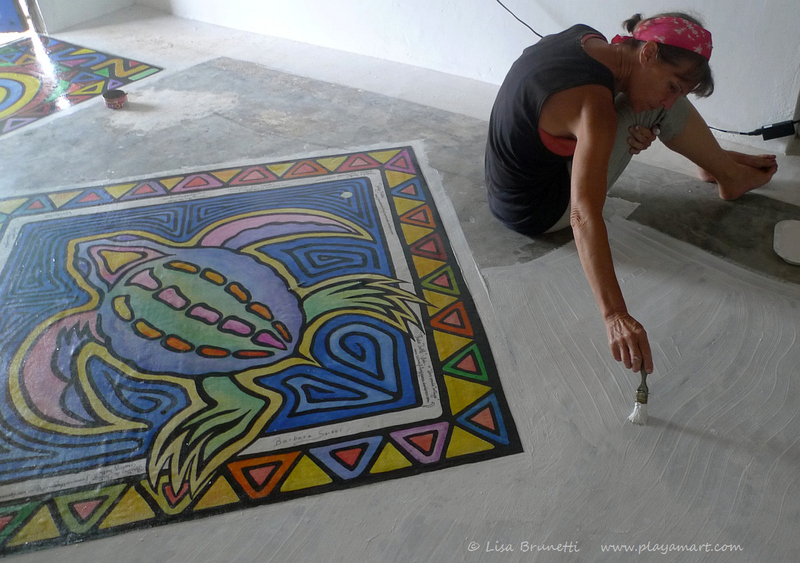 yes, i love transforming concrete floors into works of art!